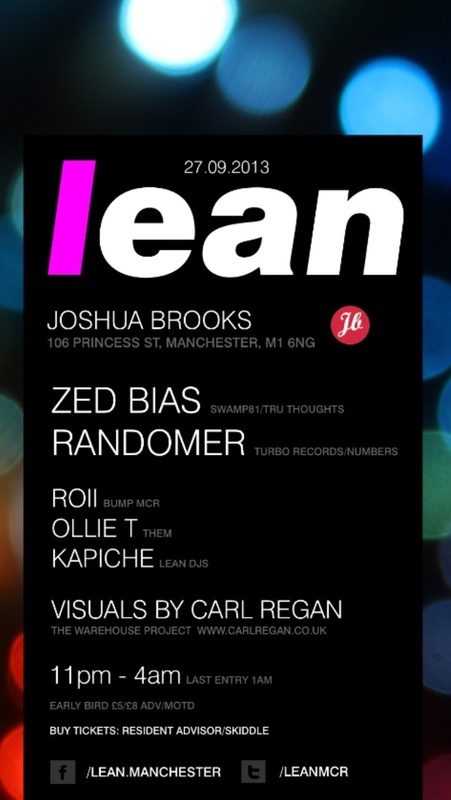 Lean MCR is a new club night hitting the rainy city this September. Spearheaded by experienced promoters hailing from London and right here in Manchester, we aim to bring you massive line ups in an intimate venue with amazing visuals. With parties due to run over the Spring, Autumn and Winter and with the launch night in September and huge plans for NYE, Lean will soon be a big part of Manchester nightlife. Our influences range from Berlin Techno, Acid House, UK Funky, Juke, Jungle, Garage and Grime, guaranteeing you a music policy as diverse as we know the crowd will be. So with all this in mind we are launching the night as we mean to go on headlining on the 27th September is Manchester based, legend ZED BIAS. One of the pioneers of breakbeat garage, his pseudonyms include Zed Bias, Phuturistix, Henchmen, Daluq, Talissman, Ruffcut Bias, Nu Design, 7 Wonders, Dekata Project, Strontium Dog – just some of the names Maddslinky, aka Dave Jones, has recorded under in the last ten years as himself or in collaboration with others. Upfront tastemaker promos of the new material have seen regular rotation from the likes of Benji B (1xtra), Gilles Peterson (Radio 1), Alex Nut (Rinse FM), Mary Anne Hobbs (Radio 1), Toddla T (Radio 1), Annie Mac (Radio 1) and more. Features and rave reviews are stacking up across the dance music press and beyond, including DJ Mag, iDJ, XLR8R, Fact, Vice, Clash and many more, with the album being hailed as a triumphant comeback for the man who never really went away, but has been busily toiling underground while the scene he helped to shape has taken the music world by storm. His debut for Hemlock Recordings found him taking things even further back to basics, dropping two heavyweight trax of pure beats and bassline indulgence. With more uncompromising raw cuts to follow this year Randomer is set to redefine the boundaries of House, Techno and Jungle. With a new Randomer EP on Turbo Recordings we’re excited to have him down.